Twin Deer began operations in the fall of 1985 as the result of over two years of research by its principals. They recognized the need for a facility specializing in John Deere ® Used / Replacement parts. At that time there were no other John Deere ® used parts distributors in the area. Since the inception of the Company, Twin Deer has shipped parts all over the world including USA, Australia, New Zealand, Germany, and Saudi Arabia. 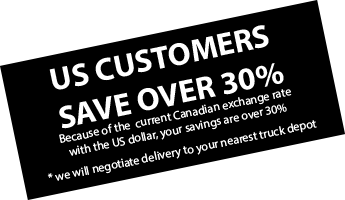 Twin Deer is a private corporation - 100% Canadian owned and controlled. We dismantle construction, utility, some agricultural equipment and forestry equipment, and sell new and used (experienced) parts and components. The management of the Company has over 40 years successful business experience in complementary fields to the business niche pursued by Twin Deer. In order to provide complete customer service, Twin Deer became a dealer for Reliance Power Parts and Maxiforce Jobber Engine Parts for use in John Deere ®. In 2001, we expanded Twin Deer and added Twin Deer Services to provide equipment repairs and service for our customers. In 2002, Twin Deer expanded into the handling of Allison Transmissions, Dana Clark Hurth, ZF, Funk, and Twin Disc. In 2002, TD Sales & Rentals was incorporated to handle the distributorship of Landini Tractors, and Used Equipment. In 2003 TD Sales & Rentals also took on the Hyundai Line of Equipment as a distributor for parts and service in Alberta. We also became a distributor of Wallenstein and BaumaLight equipment. Many of these accessory and standalone products complement our other offerings. The TWIN DEER GROUP OF COMPANIES now provides sales of used and replacement parts for various makes of equipment, selected services and direct sales of new and used equipment.